1. Floating the Bag. This is the method we are often told to use by pet shop personnel. None of the authors seems to like this method. The often stated reason for this method is to equalize the temperature. Without any mixing of the water, the only factor for which acclimation takes place is temperature. Demmer states that the plastic bags, though waterproof, allow gases to permeate. He experimented with identical bags of feeder guppies, one was floated in a tank, the other he put in a dry place with otherwise similar conditions. The fish in the floated bag showed signs of stress at one hour and death at four hours. The fish in the other bag were still lively when he released them back into an aquarium after six days. He offers no chemical theory of what's going on, just the empirical evidence. Demmer reports improved survival rates with new shipments to his store and with his retail customers' fish when this method is no longer used. 2. Floating the bag, but opened (Enright). I have seen this method in at least one Aquarium book. The bag is "floated", but tank water is added gradually to the bag. A clip (lettuce clip, clothespin, etc.) to hold the open bag against the side of the tank might be needed to keep it all from sinking. 3. Float the bag, but put a hole or holes in it to let tank water seep in. This can be a big hole (Demmer) or small toothpick size holes (Enright). The big hole method is really to let the fish swim out at their own volition. Note that this method allows the mixing of pet shop water with your tank's water.
. 4. Just dump the fish in, no real acclimation. Not really recommended by anyone but Fenner, but he does this to shipments of hardier fish, and they are put into a medicated tub, and then into a holding tank. He dislikes retaining any of the shipping water (this is long distance shipping) since it contains a host of bad things (pathogens, pollutants, metabolites). Demmer says you might get away with this method if you know that the water conditions are similar. Just open the bag (I assume you need to support the bag by putting it in a container and using clothespins to hold the bag to the container) and put in small amounts of tank water slowly. Alternatively, just pour the fish and water out into a holding (acclimating) container, and then add tank water. The addtion of water can be done by a dripline. Dripline. Demmer, Coletti, and I like this approach. Even Fenner will use it for "touchy" fishes. See "Dripline Construction", below for a summary of how to make one.
. A couple of the authors mention the notion that going to a warmer environment is not as stressful as going to a colder one. Colleti attributes that info to "recent research" but does not give any sources. In many of the methods, excess bag water is removed before acclimation begins. In all of the methods (except 3) you can prevent mixing any of the pet shop water with the tank water. You can use a length of standard airline tubing. The trick is how to deal with both ends of it. The end that goes into the tank needs to be secured. 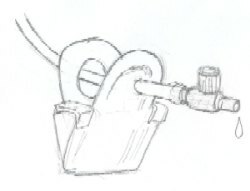 Colleti suggests using an airline gang valve with bracket. I suggest making an upside down "U" shaped device that hooks onto the edge of the tank. In my FAMA item, I suggested making one out of 3/16" rigid tubing and Whisper Swivels. Above: 3/16" rigid tubing bent so that it will hook over the edge of the aquarium. Since that time, I have found a better way: you can easily bend 3/16 inch rigid tubing by first soaking it in hot water and then bending it to form a "U" shape. A short piece of airline tubing on the end that goes into the tank insures that it will still work if the tank water level goes down. A drip. You can put a knot in it. Colleti uses an airline tubing connecter, i.e., the piece that is sold to splice two pieces of airline tubing together. This is not adjustable. I prefer an inexpensive airline flow control valve (these often come in airline control kits). This is adjustable. Someway to secure it to the acclimation container. (Or you could just let it dangle). My suggestion: get a lettuce clip, the type that has two solid flanges (the parts you squeeze to open the clip) one of the flanges has a hole in it to accommodate a suction cup. Remove the suction cup. Drill a 3/16" hole in the other flange. Insert the tubing through the hole vacated by the suction cup. Force the end of the tubing through the drilled hole. This may take some force (try pushing with a ball point pen). You want this fit to be tight so that the tubing does not move around. Insert valve. Above: a lettuce clip, suction cup removed, 3/16" hole drilled to allow standard airline tubing to pass through to hold an airline valve. You can extend the tip of the valve by putting on a short piece of airline tubing. If you use a pliable type (Python brand is good or a silicone type), then you can start the siphon action with a turkey baster. The end of the baster goes not fit very well on tubing, but you can press it into pliable tubing and provide enough of a seal with pressure from your fingers. The lettuce clip works on most thin rimmed containers, but will not work on really thick rimmed ones. Colleti suggests cleaning out the dripline with hot water between uses. I used to store mine full of tank water, so as to not require a siphon start up. Bad idea. They got gummed up. Now, I at least let them drain before storing them away. The final question is, how long of an acclimation period do we provide? Most authors prefer at least 30 minutes, but the longer the better. If the acclimation vessel becomes too full from the drip, excess water needs to be removed to allow for accomodate more tank water. I find the process of acclimation to be stressful for myself, as well as the fish. I get home with those fish and I'm aware that the clock is ticking and I need to get them out of those bags and start the acclimation process - drat, where did I put that dripline, and did I really think that they should go into this tank or was it that tank? Fumble, stumble, and now there's water on the carpet.... You get the picture. I hope that the information presented here will help you to make an informed choice of an acclimation method, and will be of some benefit to your fishkeeping. Coletti, Ted. Acclimation: A Better System. Tropical Fish Hobbyist, XLIII, No. 12 (#474) (August 1995): 146-151. Demmer, George. To Float or Not to Float? Freshwater and Marine Aquarium, 18, no. 7 (July 1995): 35-38. Enright, Michael P. How to Bring 'Em Home Alive and Keep 'EM Alive. Freshwater and Marine Aquarium, 17, no. 12 (December 1994):210-215. Fenner, Bob. Guerilla Acclimation Methods, or Acclimating: My Way. [Aquatic Environments Column]. Freshwater and Marine Aquarium, 17, no. 10 (October 1994): 99-104. Koga, James S. Improved Dripline for Acclimation. [For What It's Worth feature] Freshwater and Marine Aquarium, 19, no. 4 (April 1996): 222.